Today, the boundaries between urban and rural lands – the city and the countryside – are blurred. Worldwide, landscapes have been transforming due to the intertwined interaction of material and social frameworks powered and enabled by the Internet. Changes to the built environment in the Nordic region, driven by the commercial and market forces of digital infrastructure, are not only hiding in plain sight but also sometimes strategically ignored. Examination of these forces reveals unbalanced power dynamics and inequities that underscore the politics of nature (and the nature of politics). This is the digital backyard, an open secret that remains unseen and mostly unconsidered in planning and design. The 21st century, deemed the first urban century, marks the fastest rate of change in the global economic balance in history.1 This narrative charts how the European centres of world commerce and economy with growth peaking in the early 20th century have since the 1980s been displaced by urbanization in Asia and the Americas. The assumption is that large cities in developed and developing economies are the centres of human activity. In contrast to this narrative evidence shows that today rural areas make a greater contribution to global GDP than dense built up areas.2 In other words, rural lands are interwoven into wide-reaching economic strategies and social relationships. This kind of diffuse urbanization cannot be explained without its relation to the countryside. Megacities have absorbed media attention. Even though landscape architects and engineers such as Fredrick Law Olmstead and Adolphe Alphand designed public parks for capital cities of the early modern period, only recently shas landscape architecture been viewed as a part of urban practice. Architect and urbanist Charles Waldheim used the term landscape urbanism to describe the role of landscape in the contemporary public realm. New York’s High Line, Brooklyn Bridge Park, and Toronto Waterfront “supplant architecture’s historic role as the basic building block of urban form”.3 Today’s increasingly complex environmental and societal issues can not be resolved with the traditional tools of architects and urban. In fact, despite a narrative of gradual, centuries-long growth Europe remains comparatively non-urban. On the Scandinavian Peninsula, almost 75 % of the population resides on the 3% of landd that is predominantly urban.6 The predominantly rural lands comprising 97 % of the promontory tare generally overlooked and have not been systematically examined by architects even though forests, farms, villages, and urban sprawl are transforming into more connected and infrastructural components of a new metropolitan reality driven by digital economies. Rural areas are play an increasingly significant role in the expansion of ea digitalized and connected world. For example, early in the 20th century, iron mining of the Swedish countryside was the source of tremendous wealth. Today, the former agriculturally-based countryside of Norway, Finland, and Sweden are linked by a variety of informal as well as formal digital infrastructures underpinning industrialized food production; real estate speculation; cyclical migration; settings for sport, leisure and tourism; and organizations for manufacturing, ,transport, natural resource extraction, energy production, and ecosystem preservation. Scandinavia is also uniquely identified with the architecture of catastrophe: New typologies of building for extremely long-term containment of dangerous substances and hazardous wastes – like the Onkalo spent nuclear fuel repository in Finland’s Eurajoki municipality – and gene banks to ensure future biodiversity and food security, such as the Svalbard Global Seed Vault. Rural territories of the Baltic Sea region are currently the ideal sites for data centres due to a frigid climate, great amounts of remote land and plentiful sources of water. Sweden and Finland have attracted massive foreign investment from progressive data-driven business models like Amazon Web Services (AWS) and big data companies for digital information storage (server farms for Google and Facebook). It seems the countryside of Far Northern Europee is increasingly embedded in global networks. The dominion of the digital is concrete, comprised of isolated blocks to house facilities for equipment and activities, many of which are carried out largely unseen, out-of-sight and frequently without many people. These crucial infrastructural sites and objects are viewed as purely functional in the public perception just as artificial intelligence is so ubiquitous we rarely notice it. Following the polar opposition between the digital and the physical popularized in the early 2000s, the digital and physical realms are now acknowledged to be increasingly and unstoppably converged. The desire for cities to be smart – for embedded digital technologies to facilitate sustainable, diverse, equitable, and beautiful urban form — embodies both promise and threat. Even as cities are being made safer and more efficient (self-driving cars are predicted to save thousands of lives per year and to transform streets and parking), scientists and engineers work on building computers that can achieve human-level intelligence. The doomsday scenario is that technology will reach the “Singularity”–the point when artificial, superior intelligence becomes smarter than we are. Digital infrastructure drives industry, economy, and real estate investment. The early modern industrialists Rockefeller, Morgan, and Carnegie – also known as “robber barons” – commissioned architects to build factories, office buildings, and public spaces of the American city. Today, disembodied tech giants Amazon, Google and Facebook – as well as Alibaba, Baidu and Tencent – make the most money and will continue to affect the relationship of town and country worldwide. Together with the architects of Silicon Valley, the Nordic countries are complicit in global, environmental growth and degradation. Finland has become one of the most connected nations in the world. In the year 2015, Internet users numbered 5,117,660, or 93.5 % of the country’s 5.5 million population.7 Initiatives, such as the bid of the Finnish Communications Regulations. Authority (FICORA) to connect rural Finns to reasonably priced broadband and the digital economy, target the challenges to social and economic life faced by people living in isolated communities. The inclusion of geographically-isolated shrinking villages with aging population is part of goals to bridge the urban-rural gap. One might view the Internet as part of the package of social services provided by the government. In a sparsely populated country, the digital industry plays a primary role in the representation and perception of rural territory and settlement. 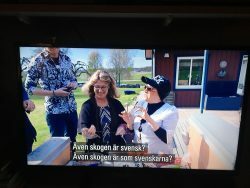 From Madame Deemas underbara resa on SVT, https://www.svt.se/madame-deemas-underbara-resa/. 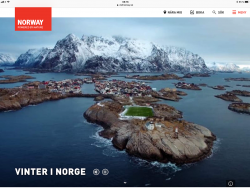 Official webpage of visit Norway connecting landscape with identity. Despite the Nordic region’s exploitation of their landscapes for global capitalism, nation state interests founded on memories, myths and iconographies of landscape persist. The countryside imaginary is a realm separate and distinct from the city; as such it is a medium through which traditional values in a changing world may bee reaffirmed and reproduced. The political division between the urban and the rural in Europe has only been exacerbated by Brexit. Political visions and rhetoric have been calibrated to pay attention to the representation of rural communities. Due to Western culture’s inherited notions of naturee and the popular image of rural lands as bucolic terrain vague largely void of activity, we have yet to fully grasp what is happening before our eyes sight unseen. Architectural discourse and academia interrogate the impact of cities on rural development and the evolution of the town and country continuum. The topic is rapidly becoming the topic of upcoming exhibitions and publications. Some questions remain: Is current interest in the countryside merely a fleeting trend or will there be a (r)evolution of urbanism to address the co-dependent relationship of urban and rural? How can awareness of social and environmental disparities motivate new narratives, initiatives and strategies for architects and urban planners?